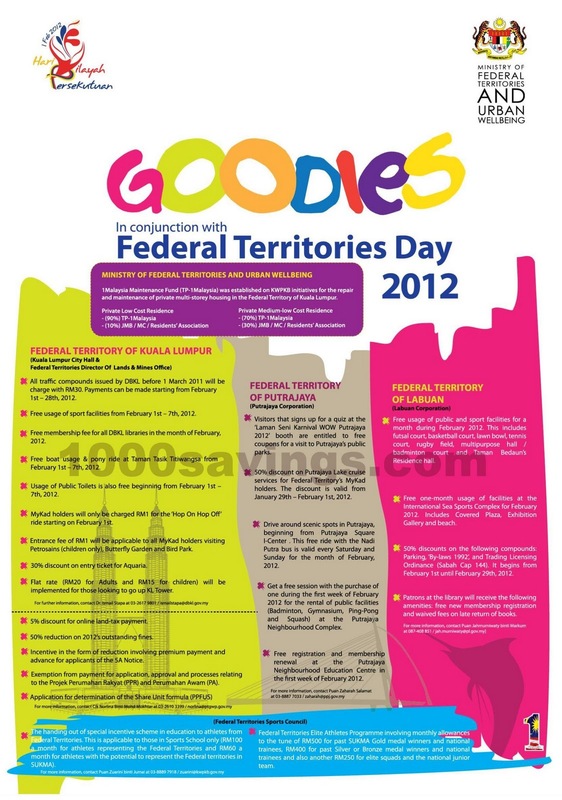 All traffic compounds issued by DBKL before 1 March 2011 will be charge with RM30. Payments can be made starting from February 1st - 28th, 2012. Free usage of sport facilities from February 1st - 7th, 2012. Free boat usage & pony ride at Taman Tasik Titiwangsa from February 1st - 7th, 2012. Usage of Public Toilets is also free beginning from February 1st - 7th, 2012. MyKad holders will only be charged RM1 for the 'Hop On Hop Off' ride starting on February 1st. Entrance fee of RM1 will be applicable to all MyKad holders visiting Petrosains (children only), Butterfly Garden and Bird Park. 30% discount on entry ticket for Aquaria. Flat rate (RM20 for Adults and RM15 for children) will be implemented for those looking to go up KL Tower. 50% reduction on 2012's outstanding fines. Incentive in the form of reduction involving premium payment and advance for applicants of the 5A Notice. Exemption from payment for application, approval and processes relating to the Projek Perumahan Rakyat (PPR) and Perumahan Awam (PA). Visitors that signs up for a quiz at the 'Laman Seni Karnival WOW Putrajaya 2012' booth are entitled to free coupons for a visit to Putrajaya's public parks. 50% discount on Putrajaya Lake cruise services for Federal Territory's MyKad holders. The discount is valid from January 29th - February 1st, 2012. Get a free session with the purchase of one during the first week of February 2012 for the rental of public facilities (Badminton, Gymnasium, Ping-Pong and Squash) at the Putrajaya Neighbourhood Complex. Free registration and membership renewal at the Putrajaya Neighbourhood Education Centre in the first week of February 2012. Free usage of public and sport facilities for a month during February 2012. This includes futsal court, basketball court, lawn bowl, tennis court, rugby field, multipurpose hall / badminton court and Taman Bedaun's Residence hall. Free one-month usage of facilities at the International Sea Sports Complex for February 2012. Includes Covered Plaza, Exhibition Gallery and beach. 50% discounts on the following compounds: Parking, 'By-laws 1992', and Trading Licensing Ordinance (Sabah Cap 144). It begins from February 1st until February 29th, 2012. Patrons at the library will receive the following amenities: free new membership registration and waived fees on late return of books. The handing out of special incentive scheme in education to athletes from Federal Territories. This is applicable to those in Sports School only (RM100 a month for athletes representing the Federal Territories and RM60 a month for athletes with the potential to represent the Federal territories in SUKMA). 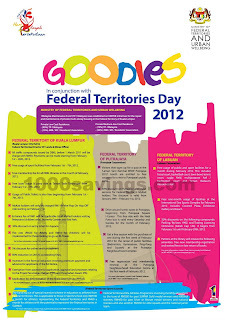 Federal Territories Elite Athletes Programme involving monthly allowances to the tune of RM500 for past SUKMA Gold medal winners and national trainees, RM400 for past Silver or Bronze medal winners and national trainees and also another RM250 for elite squads and the national junior team.